Remodeling your kitchen can be a stressful project, especially if you don't find the right contractors for the job. If you're looking to give your outdated kitchen an amazing new feel, Whalin Construction is your best resource. For installing new granite countertops, real wood cabinetry, ceramic flooring, we are here to help you with all of your kitchen remodeling needs. Whalin Constructions' comprehensive approach to kitchen remodeling affords the highest possible level of professionalism and coordination with the lowest possible amount of delay, inaccuracy, or unanswered questions. When you choose to allow Whalin Construction to handle your kitchen remodel, we are able to provide you a number of recommendations for reliable building products and suppliers in all of the areas relevant to your project (flooring, lighting, countertops, etc.). We work closely with you to ensure that your kitchen is installed on time. Moreover, once the installation is complete, we thoroughly inspect all of our work and make sure that you are happy with everything that you see. Whalin Construction allows you to rest in the knowledge that your remodel will be completed with the highest levels honesty, integrity, and professionalism. There are so many options when it comes designing new kitchens. First is the cabinets themselves. Decided on what type of wood you want? Are you looking for a light wood which will show off your countertop and hardware, or maybe you're looking for a dark mahogany which will be the spotlight of your kitchen? Then decide on a countertop. Common choices these days are marble, granite, composite, tile, laminate and even stained concrete. Lastly you're going to want to decide on hardware. This means your faucet, handles and cabinet knobs. Be sure to get the look you want but also plan for the future. What is in style right now might not be in 10 years. Give your new kitchen a beautiful look that will last the ages. There's no point in spending money on a new kitchen that you're going to want to change five years later! Whether you are exploring décor for your brand new kitchen, or looking for designs for your kitchen remodeling project, you've come to the right place. Begin by choosing a kitchen photo, then experiment with different options for the cabinets, counter, flooring, appliances and paint colors. Wonder what stainless steel appliances might look like with exposed brick walls and black kitchen cabinets? Find out! Interested in a neutral wall color and black appliances, with granite kitchen counter tops? See it here before you buy! Unleash your inner interior design expert with GE's Virtual Kitchen Designer. Kitchens are often the heart of the home, and it's certainly reflected in the amount of money consumers spend to remodel them. 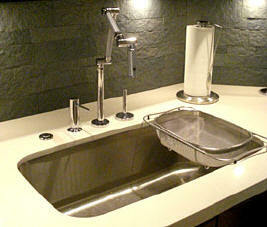 Finding quality kitchen contractors to upgrade your space will add value to your home, and improve your quality of life. When it comes to kitchen remodeling, Americans spend on average $54,000. * And, this is not a top-of-the-line remodel either (that tops out at over $100,000). However, if you don't have an extra $50,000 lying around, following is one kitchen remodeling project you can tackle yourself. When it comes to upgrading your outdated kitchen with top of the line appliances and beautiful accents you want to make sure you have chosen your area's absolute best kitchen renovation and remodeling specialists.